The Shih Tzu is a very ancient breed, but it's also an extremely popular one due to its adorable good looks and extremely good nature. In many ways, this dog is an ideal family companion, but it does require a lot of care to maintain its luxurious coat. If you're looking for a breed that is a virtual "love sponge," the Shih Tzu is a very good choice. Size: On average, these dogs stand 9 to 10 1/2 inches tall at the withers (shoulders), but they should be no less than 8 inches or more than 11 inches tall. Weight: The ideal weight is between 9 and 16 pounds, and the weight should be in proportion with the dog's overall size. Body: These dogs are more substantial than the average Toy breed due to their heavier bones. The body should be slightly longer than the dog is tall, and the topline should be level. These dogs are compact; they should never appear leggy, yet they should also not look like caterpillars. The tail should be set high on the rear and carried over the back with a gentle curve. Head: The head is very round with a domed forehead, deep stop and short muzzle. The bite is undershot, which means the bottom front teeth should close neatly in front of the upper front teeth, but the jaw should not be so undershot that the teeth still show when the mouth is closed. These dogs have soulful big brown eyes. The ears hang down. They are moderate in length, but they look much longer when the hair is allowed to grow naturally. Coat: These dogs have a long, flowing, double coat that grows continually throughout their lives. 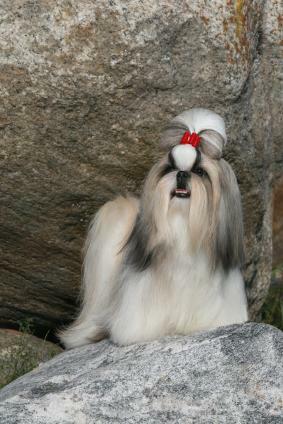 The hair on the head is banded in a top knot unless the dog is kept trimmed. All colors and markings are permissible. This breed makes a great family pet. Their temperament is open and loving, and even though they may choose one person as most special to them, they are happy to share their love with anyone who will return it. Shih Tzus are generally very good with children as long as the children handle them properly. It is up to adults to supervise playtime, since it would be unreasonable not to expect any dog to react protectively if it is being treated roughly. These dogs are generally happy-go-lucky, and unlike some Toy breeds, they do not normally display hyper personalities. They are happy to play with you, but totally willing to go lay down somewhere out of the way and take a nice break. They are also not known to be nuisance barkers. Dogs of this breed should move freely and naturally hold their heads high and their tails gaily over their backs. Their movement is fluid and straight. They should display good reach in front and equally good drive in the rear. Shih Tzus are very intelligent. You can literally see their thoughts through their eyes. Potty training is not very difficult as long as you are consistent with your efforts. Many Shih Tzus will learn to come tell you when they wish to go out. These dogs also do well in obedience and agility trials, and training them is fun for both dog and owner. Shih Tzus want nothing more than to please you and spend time together, so keep the training full of positive reinforcement. Shih Tzus do not respond well to scolding, and they will stop responding to your efforts if they feel threatened or become upset. A Shih Tzu kept in full flowing coat is a glorious sight to behold; however, this is simply not feasible for the average house pet. This small dog has what is known as a double coat. The human-like hair of the outer coat is supported by a softer, more cottony undercoat. There are several different ways to groom a Shih Tzu, so choose one that works best for your dog's style. Wash the dog's face and beard at least every other day to prevent staining and remove eye debris. Give the dog a full bath every two weeks. Clean out the dog's ears once a week and remove excessive hair growing within the ears by gently pulling it out in small sections at a time. Brush the dog's teeth three to four times a week minimum. Keep an eye on the nails and trim as needed. On a related note, many allergy sufferers report that they have very little reaction to Shih Tzu hair, unlike other dog coats, and therefore consider these dogs somewhat hypo-allergenic. Shih Tzus do quite well when they receive moderate exercise. A daily walk of 15 to 20 minutes is sufficient to keep them toned, and the fresh air and change of perspective provide good mental stimulation. Keep in mind, though, that these dogs can be real couch potatoes. If you neglect to walk them on a regular basis, they'll likely become overweight. According to the American Shih Tzu club, here are some of the main health problems the Shih Tzu is prone to experience. According the American Kennel Club breed history, the Shih Tzu is one of several breeds that was kept and developed in the ancient palaces of China, and its existence can be documented back as far as 624 A.D. It's believed these dogs were the smallest and the oldest of all the dogs the Tibetans believed to be holy. The breed almost became extinct during the communist revolution in China, but some specimens were smuggled out of the country. Today, the entire breed owes its current existence to just seven males and seven females. The breed received official recognition from the American Kennel Club in 1969. 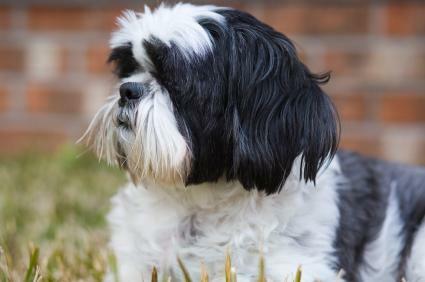 Is the Shih Tzu Right for Your Family? Shih Tzus make delightful companions, but they do require quite a bit of grooming to keep them in good shape. Before you decide to bring one home, visit several breeders, and ask at least one of them to demonstrate the right way to brush through the coat in layers because this is essential to preventing mats. Get to know the personality on these dogs first hand, and then you can decide if this is the right breed for you.